If yes then you are absolutely right..,! Egg benefits for hair are one of the traditional methods for hair care in the world. now we are living in a polluted atmosphere where every day we face many problems with our health. the main cause is the polluted environment and chemical treated products that we use in our daily life. Egg mask gives the natural moisture and it uplifts the hair texture. the egg is rich in protein and biotin it provides the nutrition to the hair. This egg hair mask will resolve all your hair related problems. Ginger juice contain the antioxidants that help to detoxify the hair scalp and hair. It helps to increase the blood circulation and increase the blood flow in hair roots that increase the hair follicles. and also it reduces the hair loss and the thinning of hair. 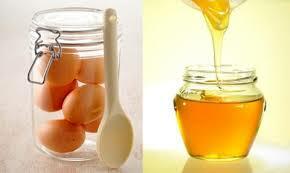 Honey gives the smooth and silky texture to our hair. It retains the moisture of our hair. Mix the egg yolk with a half tablespoon of ginger juice with one tablespoon of honey and mix it well and apply into your hair roots and leave it for 30 minutes and rinse it off. As we all know that egg gives the protein to our hair roots but with the help of lemon juice it clears the hair scalp and also prevents the dandruff problems. It stops the hair loss problem and boosts the hair growth. Mix the egg yolk with 1 tablespoon of lemon juice and 1 tablespoon of honey and mix it properly and apply it into your hair scalp let it sit for 20 minutes and then rinse it off with lukewarm water. Aloe vera is good for our hair and skin both it gives the proper nourishment that our skin needs even for the hair scalp it makes them more healthy. when we use it with the egg it helps to make our hair more bouncy and nourished. Take a tablespoon of aloe vera gel and mix it with egg and just apply it in the hair roots with soft hands and leave it for 15 minutes and then rinse it off. Milk and honey have super moisturising powers. Eggs will provide the much-needed protein and nourishment to your hair. Take 2 eggs, 1 tbsp honey and 2 tbsp milk. Mix well. You can adjust the consistency according to your need by adding or reducing the amount of milk. Use this mask to give your dry hair lots of TLC. Keep for 30 mins and wash off with shampoo. If mixed together, Eggs and Yoghurt can make an excellent hair conditioner. Take 2 eggs and add 2 tsp of unflavoured, fresh yoghurt. Use it as a hair mask, and keep it on for at least 30 mins. You can immediately see the results once you wash off the mask, your hair will be conditioned and super shiny.